July marks the 200th anniversary of Jane Austen’s death and I’m planning to write more about her other books in later posts. I regularly re-read Pride and Prejudice, but it’s been years since I last read Emma – so that is on my list for later this year. I first read Jane Austen’s Northanger Abbey when I was at school and reading it again now was like reading it for the first time. 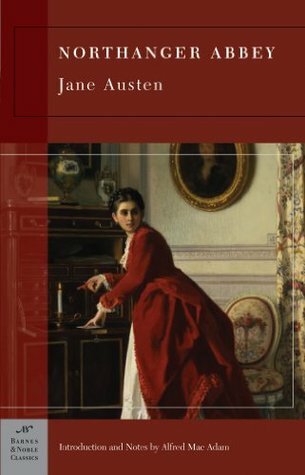 I really wasn’t going to read any of the Austen Project books (a series of books by contemporary authors give their take on Jane Austen’s novels). 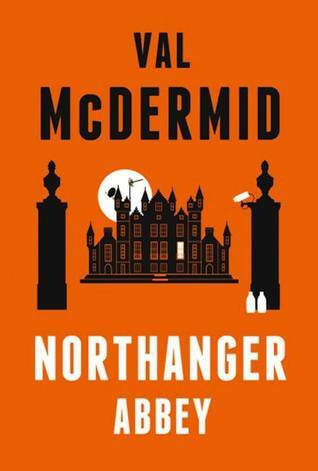 I’m not at all keen on adaptations, sequels, or prequels, but I’ve been meaning to read Val McDermid’s books for ages and when I saw her version of Northanger Abbey on the mobile library’s shelves I borrowed it. Although now I’ve read it I think it’s probably not the best of her books to start with. I can’t imagine that it’s representative of her books! As it’s been so many years since I’d first read the original by Jane Austen I thought I should refresh my memory and re-read it before tackling Val McDermid’s version. Jane Austen originally wrote the book in 1789-99, then revised it in 1803 and in 1817. Originally called Memorandum, Susan, then Catherine it was first published posthumously along with Persuasion, also previously unpublished, in December 1817, with the title Northanger Abbey, although 1818 is the date on the title page. Northanger Abbey is a love story about Catherine Morland, a naive and impressionable 17 year-old, whose imagination has been filled with visions of diabolical villains and swooning heroines from the Gothic novels of her day. Childless neighbours, the Allens, take her with them for a six week stay in Bath. Here her eyes are opened to the social complexities of real life. Bath at that time was a thriving spa resort, popular with fashionable society. The place where rich and fashionable people went to take the waters and enjoy the social life, dancing, going to the theatre and concerts, shopping and also to find a husband or wife. Here, too, Catherine meets the Thorpe family, the insufferable John Thorpe, who she immediately dislikes and his sister, Isabella who she instantly finds to be a kindred spirit – or so she thinks. She also meets and falls in love with clergyman Henry Tilney, whose father, General Tilney owns Northanger Abbey. She is thrilled when Henry and his sister, Eleanor invite her to stay with them at the Abbey, a place she fantasises about, imagining it as one of the romantic buildings full of dark corridors, with remote rooms where females are imprisoned that feature in the Gothic novels she loves. Even though the Abbey doesn’t live up to her expectations, because although it is part of an ancient building it has been modernised and made comfortable. But that is not enough to prevent Catherine’s imagination running riot, viewing the details of Henry’s mother’s death with great suspicion. The General is a most unlikeable and unpleasant character and she suspects that he could have played a part in his wife’s death – he never talks about her, and shuns her favourite walk in the garden. She imagines all sorts of Gothic horrors. Northanger Abbey parodies both the Gothic novel and intense female friendships, such as that between Catherine and Isabella as they enthuse obsessively over the horror and romance of the Gothic novel. It’s a book of melodramas and misunderstandings, exposing ambition, greed and the love of power and pleasure mixed with self-interest. Catherine only gradually learns to tell reality from fantasy. At first I read the two books side by side, a chapter from each. That worked well for a while and it made it easy to see that Val McDermid had followed Jane Austen’s book closely, changing locations and things, such as Edinburgh instead of Bath, the Scottish Borders instead of the Gloucestershire countryside, cars instead of carriages and so on. It’s the style of writing and language that is so very different. I liked the way Val McDermid substituted the Edinburgh Book Festival for Bath – that worked well and also used modern names for the characters – Cat for Catherine, Bella for Isabella and Ellie for Eleanor. And setting Northanger Abbey in the Scottish Borders is a stroke of genius. But by the time I got to the second half of the book where Catherine goes to stay at Northanger Abbey I realised it was Jane Austen’s original that was appealing more to me, so I finished that first. I’m not going to go into detail about Val McDermid’s version as she has stuck in the main to the original, that is, until she got to the end. I got tired of the use of modern expressions, tweets, texts and Facebook, and also the silliness of Cat and Bella, and all the vampire nonsense that replaces Catherine’s love of ‘horrid mysteries’. Yes, I could see that it was just as much a spoof on the modern obsession with vampires as Jane Austen’s parody is of the Gothic literature of her day, but I didn’t like it has much as Jane Austen’s version. However, despite that criticism, overall I did enjoy it – it’s light and easy to read. Northanger Abbey fulfils the category of ‘a book with a building in the title’ in Charlie’s What’s in a Name Challenge. Thanks, FictionFan, I’ll look out for the Karen Pirie series – I have just one of her books, The Place of Execution, a standalone and I was wondering what else of hers to read. I can’t think either why they thought of updating Austen’s books, and I have no intention of reading the other books in the Austen Project. An interesting post… enjoyed reading it. I read Northanger Abbey in my teens I think and loved it. Also enjoyed an ITV (I think) adaptation from 4 or 5 years ago. Fairly sure Robert Hardy was in one adaptation I saw too… as The General. Not my favourite JA but definitely a good read. Happy Reading. I’ve never read either author, shame on me. I re-read Northanger Abbey recently (and have yet to blog about it). What a good idea to read the books concurrently, though it doesn’t surprise me that the original won out. I thoroughly enjoyed Austen’s gentle spoof. Not sure I’d be as keen on vampires and twitter. Excellent review, Margaret, I enjoyed it very much. I’m actually planning on reading The Mysteries of Udolpho this year as part of my “Year of Jane” — hopefully before I breakdown and read Northanger. I’m not typically a big fan of retellings (unless, of course, zombies are involved. I got a huge kick out of Pride & Prejudice & Zombies), but I do have Curtis Sittenfeld’s Eligible lined up for my next read because one of my dear friends swore it was better than most! I love Austen and, like you, re-read her fairly often but I have to say Northanger Abbey isn’t one of those re-reads. Interesting reading them side by side. Not sure I could do that. Thank you for your detailed review of both versions of Northanger Abbey. I haven’t read either one, but I think I’d enjoy Austen’s original more than McDermid’s version. Sadly, I never read the original so I’d have to do that first. I hope you like the remake.